In the file below is a Masters age group report from Mark PK, with some news about upcoming plans for the age groups. 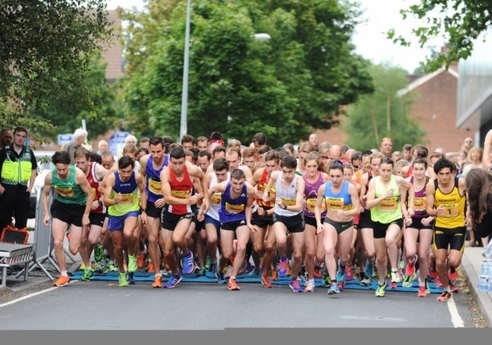 Michael Ellis ran a big personal best for 10km at the Great Yorkshire Run with 35.13. This was also an improvement of more than two minutes on his time from last year's event. There are three TAC distance runners in action today, for their university teams in the States. Ryan Driscoll ran for San Francisco in the Roy Griak Invitational at Minnesota. Ryan finished 42nd, admitting that the heat affected him over the last three kilometres. He was with the leaders through 5k. Lucy Reid ran a pb for 5k on the road of 17.24 to finish as 4th lady in this corporate challenge event. Lucy was representing JP Morgan. Full results are at http://www.cityvwharf.com/results-2015/ (one of the ladies listed ahead is a timing error). Results available at http://www.afd.org.uk/2015-results/ and on the Results 2015 page. Max Nicholls, running for Great Britain, finished 6th in the under 20 mens race. Full results are now on the Results 2015 page. TAC runners put in a dominant performance over the multi terrain 10 mile race at Eridge, filling the first four men's places and the first two women. 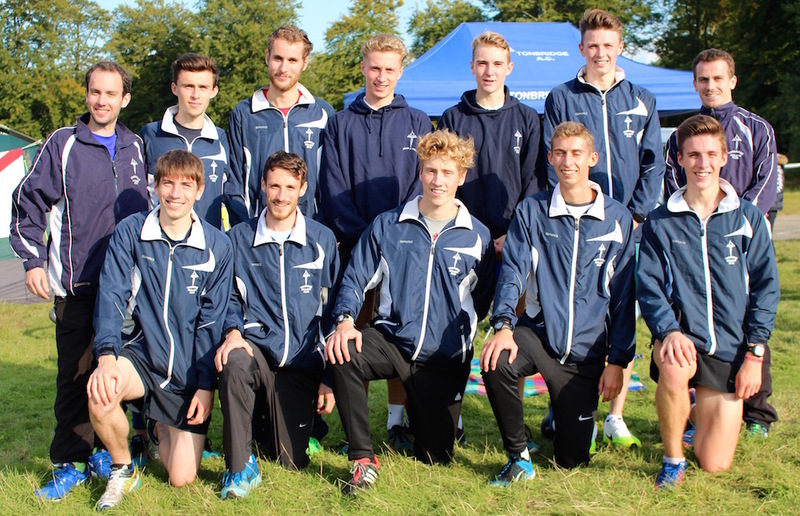 Tonbridge AC won the men's race for the sixth year in a row as our top two teams battled it out for the honours. We also had the third team, whilst Blackheath finished fourth. Herne Hill Harriers held off Blackheath for the women's title. The winning TAC team consisted of Tom Cox, Dan Bradley, Alasdair Kinloch and Alex Howard, who won by just seven seconds from George Duggan, Corey De'Ath, Stuart Brown and Alex Howard. This was despite Corey (12.35) and George (12.54) running the fastest legs of the day. Tom Cox was the only other athlete to break 13 minutes, with his 12.57 stint. Corey's time was the fastest TAC leg recorded in the last ten years or so, beating Andy Combs 12.42 from 2010. TAC's ladies team were 4th, whilst new recruit Shauna Paice was the fastest of our girls with 16.21. Senior and Junior results are on the Results 2015 page. We have noted a few anomalies with the leg times by some of our 3rd and 4th leg runners, whilst in the Junior race its known that a few runners went off course and ran short ! 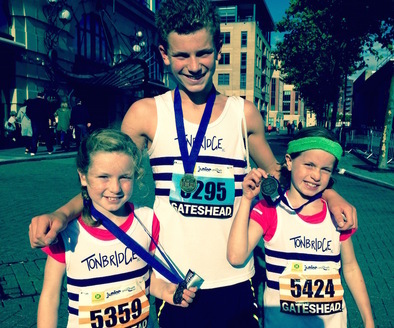 The Slack family travelled to the North East for the Junior Great North Runs. George ran 15.40, Sophy 17.04 and Lily 17.26. On Sunday John Harley was 4th on the over 60 category at the Great North Run in 88.03. I popped down to the Tonbridge parkrun where Andrew Mercer was first home in 17.00. Alex Hookway was 3rd in 17.57, whilst there was also a good run from Lucy Thompson. Luca Russo made his debut for the University of Missouri at this 5km event. He placed 20th in 16.16. Full results are on the Results 2015 page. Harry Paton reduced his 10 mile personal best to 58.05 in the National Police Championships. Tim Faes placed second in the 3000m, reducing his personal best for the third time this season with 8.34.49. Tim's time ranks him 9th now on the TAC list and brings our top 12 average time down to a best ever for the season of 8.26.6. 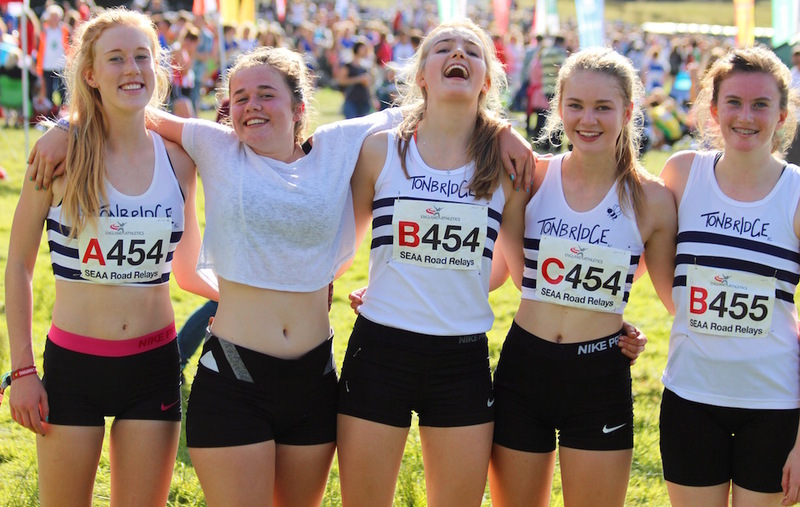 Incidentally, at the time of writing TAC has more sub 2 minute 800m runners this season than any other club in the UK and only Liverpool Harriers have more sub 4, 1500m runners. Many of these are relatively young, which bodes well for the next few years. Ben Cole finished 12th in one of the highest quality 10ks raced in the UK, setting a personal best by 16 seconds of 30.22. His brother Greg also ran a pb of 33.52, which took 17s from his previous time. Robbie Farnham-Rose, racing for Alabama University, found himself in the unusual situation of starting a cross country race at 10pm on Saturday night. Competing in the Brooks Twilight race, over 4 miles, Robbie (20.07) placed 2nd to Kenyan team mate Antibahs Kosgei (19.49). Full results are on the Results 2015 page. Ryan Driscoll had a very encouraging debut for San Francisco University in this 8km cross country race. He finished second and first scorer for his team, just 2 seconds away from the winner, in 24.26. Full results are on the Results 2015 page. rather smart Camelbacks as prizes - completely unexpected and gratefully received. Nina came in 4th having rather cleverly overtaken Sasha who took a wrong turning. I would really highly recommend the race. It started at Groombridge Place and took a broadly circular route out through Harrison's Rocks. It had a little bit of everything with a short road section, lots of muddy paths and stiles and a great section clambering up and down the base of the Rocks. The event was impeccably organised and it had a really nice relaxed feel. Robbie Farnham-Rose races over 4 miles at the Brooks Twilight Classic, at Memphis, with a race start of 10pm ! (about 4pm Sunday morning UK time). I believe Flotrack are featuring this race in some way, so some video highlights might be available soon after. James Taylor has launched the 2015/16 TAC Fantasy Cross Country League. Full details, with entry forms, are available on the Fantasy Cross Country League 2015.16 page. Entries close 30th September 2015 - Help raise club funds and add a new dimension to your cross country season ! 'JT' launches the first ever TAC Fantasy Cross Country League on Monday ! This message has been received from Tonbridge parkrun. Many of our runners benefit from the parkrun, so if you can help out occasionally please do. It's September! the schools are back and where did our summer go? If you managed to get away over the summer holidays I hope you had a fantastic time and feel refreshed and raring to go again. We started August with our TAC takeover and were able to continue an almost full volunteer roster throughout the month which was so much easier to organise than the same period the last year when we were really scratching around for people to help; if you were able to help out over the last month or so, thank-you so much! We would like to continue that momentum in to the back end of summer and beyond so would like to invite you to have a look at the forthcoming volunteer roster page at http://www.parkrun.org.uk/tonbridge/futureroster for the current state of the volunteer roster for the next few weeks. If you are able to help out on any weekend we would love to hear from you. We would like to encourage all runners to volunteer once every ten runs so if you are able to take a look at your diaries and find a week where we are short http://www.parkrun.org.uk/tonbridge/futureroster and drop me an email with any dates that you are able to help out it would be most appreciated. This will be the last Big Hitter listing of the season. Well done to everyone who has improved their personal bests this season. Ellie Cohen 3000m and Emily Hale 800m, both after long term injuries. Robbie Farnham-Rose, who is at Alabama University, finished 5th over a 5km cross country race, against two other colleges on Tuesday evening. Robbie is the first of our TAC runners to compete in the USA this season, with Ryan Driscoll expected to open his account for San Francisco this coming weekend. Luca Russo is at Missouri, whilst Kieran Reilly is back home, but due to continue his degree at Eastern Michigan in January. 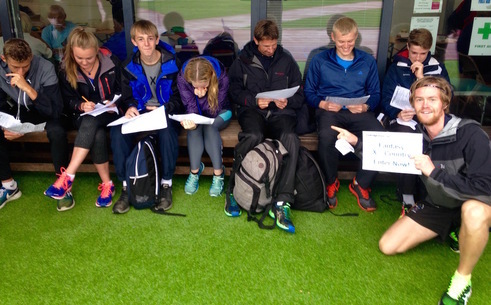 Full track results are on the Results 2015 page, plus a summary of the TAC distance runners. Alice Wood being the fastest female on the day over 800 and 1500. Emily Hale back racing for the first time since February. Some terrific under 11 600m races, from the girls and boys. 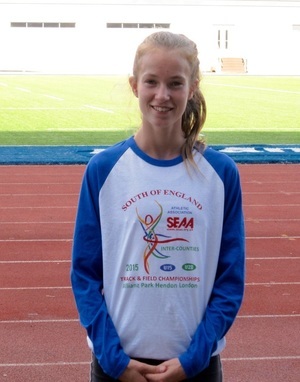 On day 2 of the championships Polly Pitcairn-Knowles finished 8th in the under 17 1500m steeplechase in 5.33.71. In the under 17 men's 3000m, Alasdair Kinloch was 8th in 8.48.78 and Jamie Goodge 19th in 9.09.40. 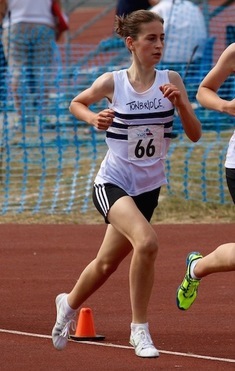 Kathleen Faes became National under 15, 1500m champion, with a convincing victory, in what was a straight final on Saturday. Sam Crick 9th in u17 1500m steeplechase and Bede Pitcairn-Knowles 14th in the same race. Donald Carter convincingly won the British Milers Club 1500m A race at Tipton in 3.52.3. Results will appear at http://www.britishmilersclub.com/results/bmcresultsindex.aspx . More details to follow. The wet and blustery conditions from earlier in the day cleared, to give reasonable weather in the evening. It was cool and a little breezy, but still allowed for some good racing and a few personal bests to be achieved. Donald Carter was the only TAC athlete in the British Milers Club races, going in the mens A race at 1500m. He recorded a pb of 3.50.49. In the open 1500s we had a number of runners just outside their pbs, although Tim Faes (u20) ran a very even paced race to go under 4 minutes for the first time ever with 3.59.33. Alongside Tim and Donald's runs, one of the TAC highlights was seeing James West win the final race of the evening in fine style. James won with a big pb of 8.23.55, with the two halves been run in around 4.16, followed by a 4.07. Kathleen Faes won the under 15 girls 800 metres in 2.15.96, after a 2.19.21 heat. There were no other TAC runners in action and although Euan Nicholls' name appears in the results it wasn't him who ran. Full results are on the Results 2015 page. Videos loaded of TAC races ! For James West it was like a UK distance running history lesson as he lined up alongside Anthony Whiteman (6th fastest ever 1500m), Andy Vernon (7th fastest ever 5000m) and Tom Lancashire (12th fastest ever 1500m) ! TAC Summer Grand Prix table below, with one run to go. Matt Harvey placed 2nd in 38.25, in this Friday evening 10k road race. Full results are not yet available. A cool and at times wet evening greeted the runners at Eltham, for the final BMC meeting this season, at Sutcliffe Park. John Harley set another TAC over 60 age record, taking two and a half minutes from Maurice Marchant's previous mark, with a superb 19.11.8. Both Miles Weatherseed (1.53.61) and Jamie Goodge (2.01.62) won their 800m races and reduced their pbs significantly. There were also 800m pbs for Michael Ellis (2.02.49), Jack Keywood (2.02.83) and Ewan Wood (2.21.46). Simon Fraser (2.03.71) improved his season's best once again, to run his quickest 800m since 2007. Thanks also go to Sean Molloy, Tim Faes, George Duggan, Alex Hookway and Miles Weatherseed for helping the British Milers Club with pacemaking duties, across a number of races. TAC had just a few competing at Ashford over the weekend. Many of those who may have raced were either at the Southern League, a St Marys training camp or on holiday it seems. However, a couple of the under 15 girls had terrific runs. Clara Tyler finished 6th in the 800m final, with a new pb of 2.24.27 and Lizzie Miller was 4th in the 1500m, also in a new best of 4.54.29. Many thanks to those who helped and competed at the Southern League, as TAC came away with a 5 point win over Bedford, as Thames Valley Harriers and Portsmouth finished 3rd and 4th. Alice Ralph was the only TAC distance runner to win and set a pb, as she lowered her 1500m best to 4.46.8. There were wins for Sean Molloy (400m, although declared as a non scorer), Alex Hookway (800m), Tom Cox (5000m) and Michael Ellis, who had a titanic battle with Harry Paton, in the steeplechase. Ellie Cohen deserves a big mention, as she has been out for a few weeks with an injury, but after ten days being back in training turned out to ensure a full complement of distance runners were in action. Ellie made her debut at 3000m, declaring at the finish that she enjoyed it ! Tunbridge Wells - Dan Watt showed that he is adapting to recent fatherhood and getting back to his best, when he was first home in 16.33. This is a course pb and only 13s outside Ben Cole's course record. Greg Cole was 2nd in 17.46. Tonbridge - Andrew Mercer was first home in 17.06. The first female shown is a Lucy Thompson running for Tonbridge AC IN 21.07, but she is not listed on the current membership database. Elsewhere Jesse Magorrian was 2nd at Hastings in 17.56. TAC members had a better than 10 out of 10 night, as 12 raced and 12 ran personal bests ! Perfect windless conditions, plus a great attitude from the group to just go for it, resulted in a mass of pbs. Summary results are on the Results 2015 page. 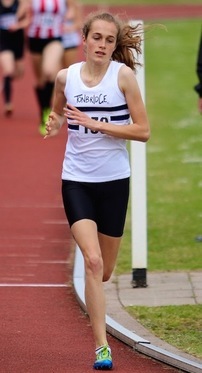 A very nervous Becky O'Hara was the first of the TAC group in action and ran her usual aggressive race over 400m. She surprised herself by improving her two year old pb to run 58.29. Duncan Ralph then ran in the first of the 24, 800 metre races and reduced his own 2 year old pb, with 2.39.38. Polly Pitcairn-Knowles ran 2.25.73, which saw yet another best obliterated. We then had Alice Ralph and Hannah Czarnowski in race 11 and despite having both been away last week (they did train) both reduced their very good pbs from a month ago with 2.14.59 and 2.17.78. The TAC minibus had a 'guest' for the night, as sprinter Zak Skinner made his 800m debut, even wearing baggy shorts for the night ("as distance runners don't wear lycra !"). Zak, who is under 17, ran 2.14.44. Next up was Ollie Harding, who front ran race 17 and ran a pb of 2.03.75, although being caught by a number of athletes towards the finish. I thought that Christian Lee may have missed out on his sub 2 attempt in race 18, as I timed him at 1.59.9+. However, it was one of my better timing performances and the photo finish recorded 1.59.99 ! In race 19 we had another front runner as Stuart Brown (1.59.09) went for it and led most of the way. He was pipped near the finish, by the winner and also Tim Faes (1.59.05), but also helped Ben Murphy (1.59.62) make it three in one race go sub 2 for the first time. So on the night TAC had four athletes break the 2 minute barrier for the first time, making it 17 in total this year. This is still short of the 21 who managed it in 2013. Graeme Saker reports that he ran the mile at Dartford in 4.54.0, although official results are awaited. This would have taken three seconds from his TAC over 50 age record, set last month. There were a couple of fine TAC performances at the Blackheath Open Meeting on Monday. Dan Seagrove ran a new personal best of 4.19.72, which was an improvement of 17.2s on his pb from last year. Then in the 800m Christian Lee was second in 2.01.67, just two tenths of a second away from his best. “Record turn out for the grand prix qualifying park run today on the Tonbridge AC takeover event. Bumper points available! James Taylor was not present to take advantage and has slipped to 5th place as Dan Bradley, Steve Keywood ,Cain Bradley and Bede PK over took him. Dan has a slender 3 point lead over Steve, who crucially has reached this position with only 3 scores as opposed to Dan’s 4. Bede is in a similar position a few points further back. Andrew Mercer (83.05% today) and Julian Rendall (81.73%) are both back running well and score highly on age grading so despite only having two scores recorded so far may well be in with a shout if they can run at the last two events 22nd Aug and 5th Sept, both at Tonbridge. The same applies to Sam Crick on 40 points”. Three hundred people finished the Tonbridge parkrun, with around 30 being TAC members. Many thanks to all the volunteers who helped marshal, timekeep, manager the finish area and pace. Robbie Farnham-Rose was first home in 16.06, with Ellen Crombie the first female in 19.04, being 10th overall.